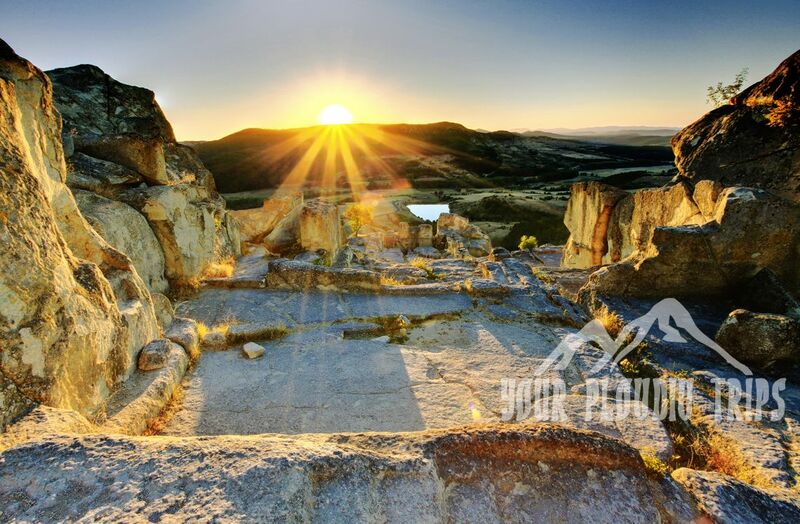 The medieval archaeological complex Perperikon is one of the most ancient monumental megalithic structures, entirely carved into the rocks It is is located in the East Rhodope Mountain, 20 km northeast from the town of Kardzhali and 97 km from Plovdiv. 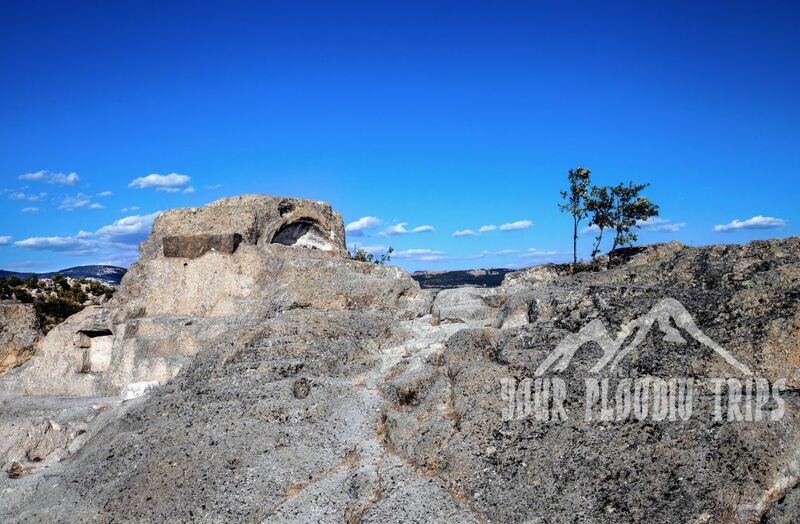 The rock city stands on a cliff top at a height of 470 meters. 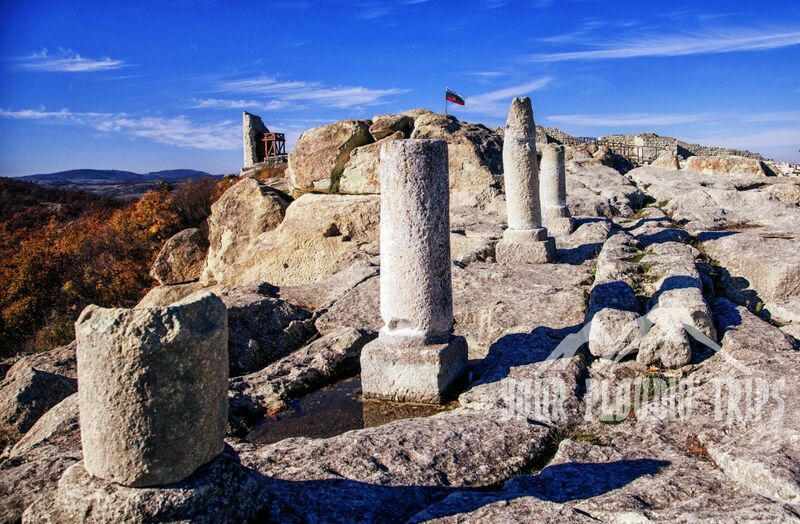 It is one of the most popular tourist destinations in Bulgaria.Religious activity at the top of the cliff began in the 5th century BC. In the last millennium of the old era the rock structures grew and became a town with fortified walls, palaces and suburbs. The town was probably a royal residence for the Thracian tribe Bessie. Subsequently the Romans brought to Perperikon their luxury and refinement, and the Goths ruined and burned down Perperikon in 378 AD. 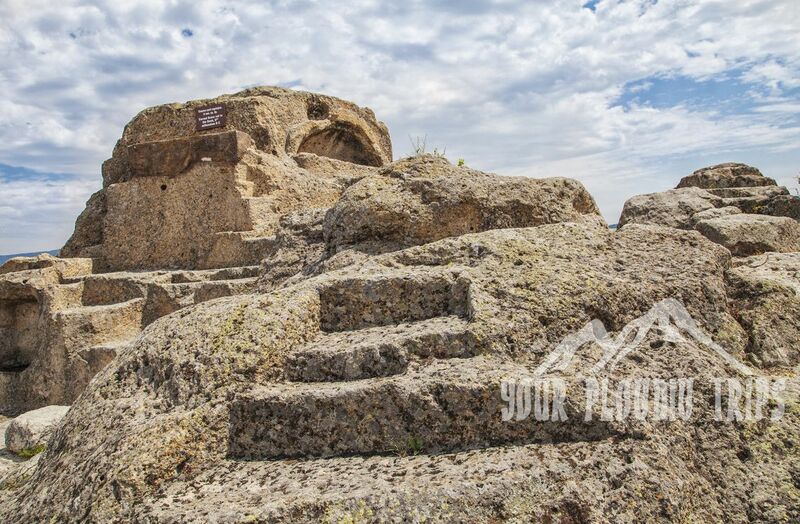 In the beginning of the 5th century AD the rock town became an Episcopal center after the people in theRhodope mountains accepted Christianity. In the end of the 14th century the Ottoman Turks conquered and destroyed the fortress. Today the ancient glory of Perperikon rises. The holy city is unique in terms of archaeological, historical, environmental and multi-religious aspect – it is one of the World’s Wonders. The Thracian sanctuary near Tatul Village is one of the most imposing megalithic monuments discovered on the territory of Bulgaria. The sanctuary is a massive rock structure and its top is a truncated pyramid. It dates back to the end of the 5th and the beginning of the 4th centuries BC. The rock pyramid and the tombs surrounding it were built in the 13th – 11th centuries BC when the sanctuary reached its first zenith. 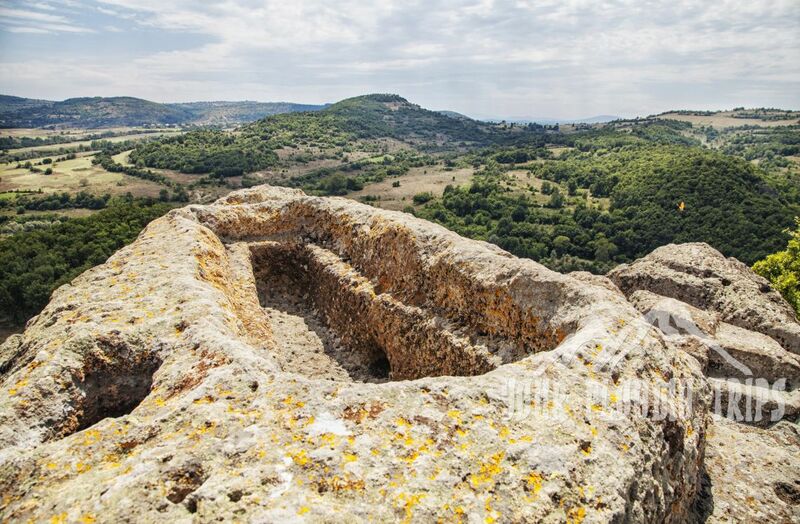 Hundreds of religious artefacts were found there, including clay human idols and spindle elements, models of vessels, bronze items, figures of the God of the Sun, etc.According to historians the sarcophagus, the truncated pyramid and the side chamber illustrate the funerals of Orpheus and King Rhesus of Thrace, who according to myths reigned in the southern part of the Rhodopes and fought in the legendary Trojan War.Several buildings were discovered inside the sanctuary. One of them is a marvelous temple with 6 m-high walls that have survived to this day.It is believed that the Hellenistic temple and the buildings surrounding it were transformed into a fortified Roman villa that became the residence of a wealthy local aristocrat.The Wonders of Bulgaria Campaign took place in 2011 and after online voting the site was named one of the 10 wonders of Bulgaria. The phenomenon Stone Wedding is probably the most interesting rock formation, which can be seen among the so called, Kardjali pyramids. They represent a large group stones of which have eroded into bizarre shapes on different scales. The Kardjali pyramids are situated on the hills in the Eastern Rhodopes, only a few kilometers from the town of Kardjali.These beautiful natural formations are among the most visited by tourists of natural pyramids in Bulgaria.Furthermore located near the village of Beli Plast is the Stone mushrooms phenomenon. 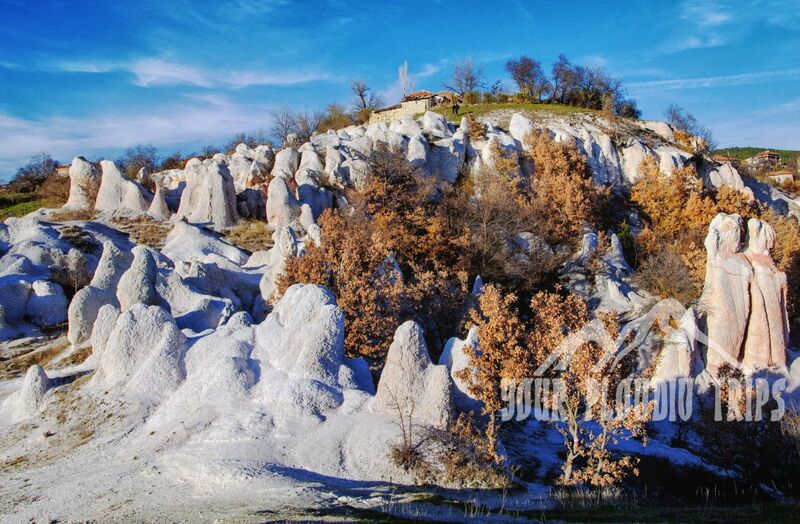 The Stone Wedding raises the curiosity of people with their unique forms in which one can easily recognize the images of people, animals such as horses and birds, pillars, and some which have left its visitors very impressed with one sculpted into volcanic tufts. Stone Wedding was formed near the village, Zimzelen only about 4 km east of Kardjali.These intriguing rock formations extend the total area of about 40 acres, they represent a unique and beautiful view. Most of the rock pieces reach a height of about 10 meters, and the presence of various metal oxides in the rock gives them a variety of colors, as Stone Wedding is interesting being colored in pink, red and brown. In the year of 1975 the phenomenon, Stone Wedding was declared a protected site. You start 9.00 A.M. After 1 hour and 30 minutes drive you stop in front of Perperikon. For 40-60 minutes you explore this archeological complex. 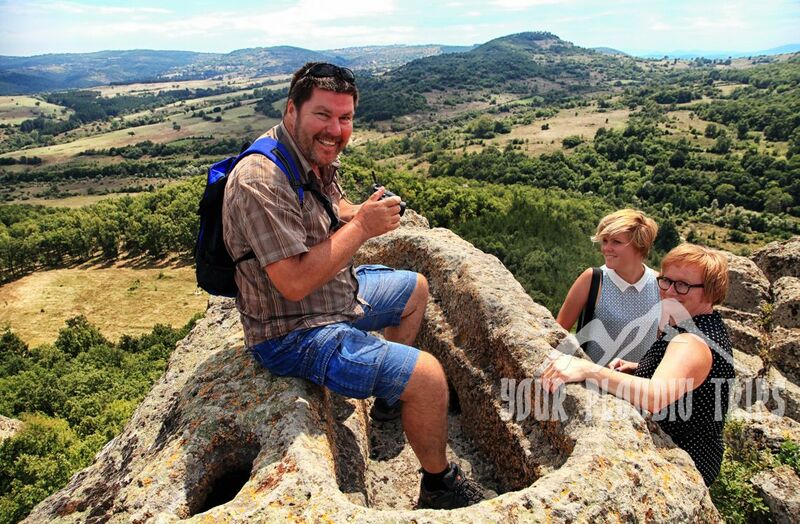 From here you are back in the car and after 30 minutes drive you stop just below the Thracian sanctuary of Tatul. You walk and explore the site for 30-40 minutes, then you drive back to the city of Karjali. You can have the lunch there. Then you are back in the car and drive to the natural phenomenon Stone Wedding for 15 minutes. 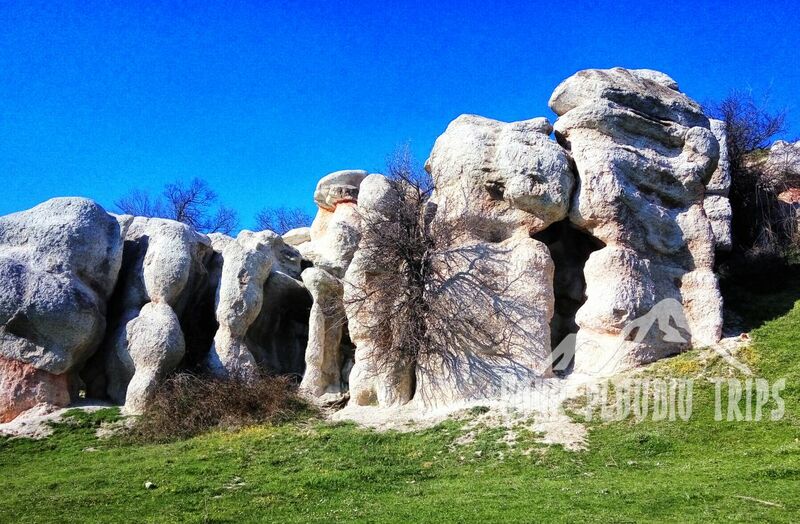 You stop there and explore this beautiful natural formation for about 30 minutes. You drive back to Plovdiv for about 1 hour and 30 minutes.